I'm trying to use a real KoalaPad as an input device for Altirra through an original AtariAge/pixelspast Stelladaptor. I can get the buttons to work (mapping to gamepad buttons 1 and 2) but can't find the right input mappings for the tablet part which according to the documentation should read as PADDLE(0) and PADDLE(1). I have tried all the Joystick 1-4 V and H mappings as well as the POV joystick but always get 228 as an output and no response on any touches to the KoalaPad. It should basically connect the same way as standard Atari paddles. I have tried the settings from this thread but to no avail (output 228 for both paddles). Edited by Irgendwer, Sun Mar 17, 2019 4:08 PM. First step is to open Input > Input Setup and check that the paddle inputs are coming through. 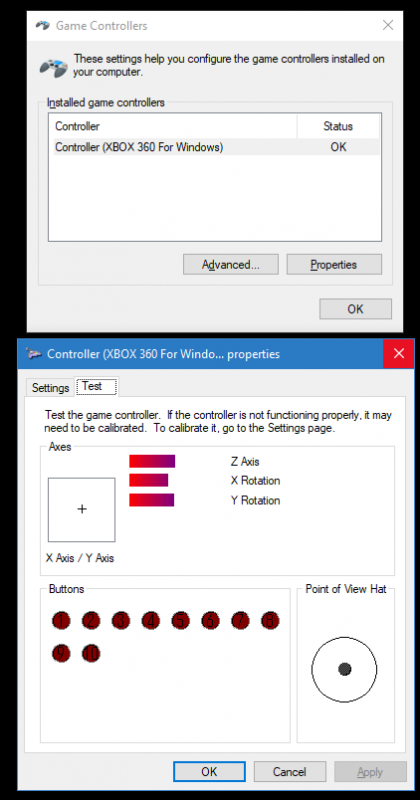 This dialog shows the inputs that are coming from the Windows gamepad API, so it is before any of the input mappings. They are most likely coming through as left analog stick, but that may not be the case and regardless you will want to turn the dead zone down to zero. Assuming it is coming through as left analog stick, Joy Axis 1H/1V would be the correct sources to use in the emulator. The POV hat isn't it since it's just a digital directional input like the CX40 joystick. It is named because it used to be mapped to a small clicky directional disc at the top of the joystick which could be used to turn the camera (POV = Point of View). These days, gamepads frequently map their D-pads to it. As for why the emulator doesn't provide the mappings by default, historically all of the default mappings used to be automatically copied into the registry and appear in the active list. That would get cluttered very quickly with the combinations of host and emulated controllers. Current versions have a separate Preset list that can have mappings separate from the default list, so I've started adding some there. But even in this case, mapping analog inputs to the pad in absolute mode would be uncommon -- typically the input device would either be a mouse in screen mapped mode or a gamepad stick in relative mode, which would use a different mapping. I see nothing at all on the input setup, not even the triggers (which work as buttons 1 and 2), stick indicates left/up, other than that no joy It's been quite some time but I recall paddles working with that Stelladaptor. Update: same results on a windows machine. Tried paddles and they show although I get 228 through about half of the turn. Controller input has to be visible in this path for Altirra to see it. If you can't get the inputs to come through here, then you'll have to double-check the Stelladaptor's installation procedures and documentation. Another thing to check is whether the Stelladaptor shows up in the Game Controller drop down on the input map editor in Altirra. This field defaults to "Any" and will list other controllers in case you want to restrict the input map to a specific controller. If no specific adapters are shown here then the emulator isn't seeing the controller. As for paddles only working over half the range, that would be accurate for the Atari 8-bit. The resistances and timing work out such that POKEY's full 0-228 range only covers about half of the CX30 paddle range. Thanks Phaeron! I will check that out.